Although it is one sole administrative region, once you arrive in Emilia-Romagna you'll soon realise that in fact it holds two distinct territories in terms of history and geography: Emilia and Romagna. It may not be as popular as the regions which surround it, but make no mistake that Emilia Romagna holds just as much attraction as Veneto, Lombardy or Tuscany. From stretching countryside to soaring mountain ranges, historic architecture to world-renowned cuisine, this region is not to be missed. By far the biggest of the two regions, Emilia takes its name from the Roman Via Emilia, built in 187BC but still found passing in a straight line through Bologna, Modena, Reggio d'Emilia, Parma and Piacenza. The road slices cleanly between the plains of the Pianura Padana in the north and the foothills of the Apennines in the south. 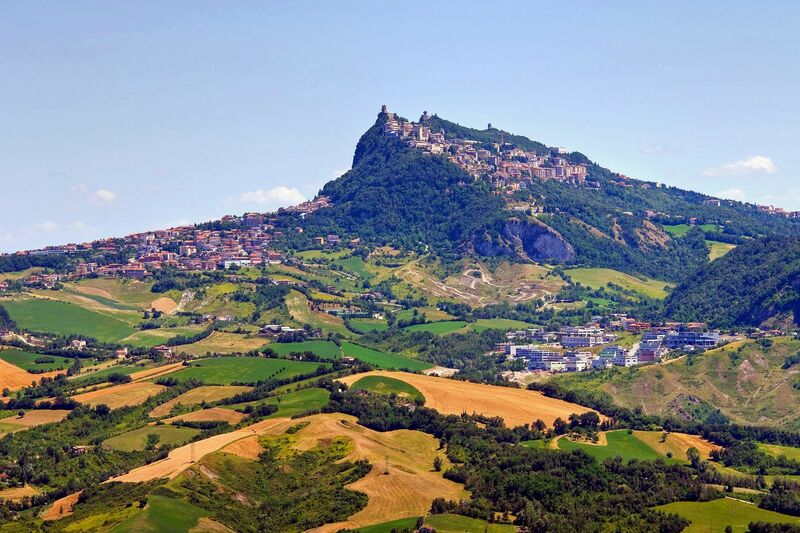 Following this line, you'll find Romagna, a coastal region to the southeast reputed for its beaches at Rimini, the beautiful Ravenna and the mysterious Republic of San Marino, sandwiched between the Adriatic and the mountains of Tuscany and Marche. Emilia-Romagna benefits greatly from its geographic diversity, numbering amongst Italy's wealthiest regions. It's a land of exceptional and, sadly undiscovered, historical patrimony, as well as a popular region with domestic tourists thanks to its fabulous beaches. The coastal resort of Rimini may have its critics, but lovers of art and history will relish the opportunity to discover towns such as Ravenna, Ferrara, Parma and Piacenza which are both off the beaten track and, appealingly, relatively uncrowded even in summer. Away from the towns and the busy coast, the Apennine mountain range offers a slightly more peaceful side to the region. With little public transport, you'll have to rely on your own wheels to access this slice of Emilia-Romagna, but boy is it worth the effort. From world-famous local cuisine to never-ending festivals in its myriad villages, the Apennines are also great for hikers. The Grande Escursione Appenninica is a 25-day trek along the range's spine, following a series of refuges which provide bed and breakfast. If ever there was a region to practice the art of epicurean travel, this is it. Emilia-Romagna is a region that is not very well known in the UK however it merits a trip to Italy all on its own. Even if you have never heard of the region's name, you will almost certainly be familiar with the cities of Bologna, Ferrara, Ravenna, Modena, Parma and Rimini and their famous sights and cuisine. If you are looking for an Italian summer destination and to avoid the crowds who flock to Venice, Rome and Florence then this is a charming alternative. One must be careful not to expect too much from the countryside in the region. The rich plains of the River Po are quite built up and the parts where you cannot avoid seeing a factory chimney or a plant on the horizon are few and far between. That said, the cities, whose visits are easily coordinated given their close proximity to one another, are true gems, especially when seen by bike. Thanks to a great layout, well signposted paths and a flat terrain, Emilia-Romagna is a cyclotourist's dream between, as well as in, the cities. But the cities are also perfect for a pleasant culinary road trip. Those for whom a little break surrounded by nature is a must will find exactly what they need over by Comacchio and at the Po delta where superb green landscapes and canals await. For those looking for a beach and a good time, Rimini needs no introduction. Although if it is culture you are after then head into the historic centre of the city where you will find plenty of treasures, sadly unknown to the majority of us. Production areas for Parmigiano Reggiano can be found in the provinces of Parma, Reggio Emilia, Modena, Bologna and Mantua. From the earth to the forage the cows are fed, not forgetting the water and the climate, everything contributes to maintainig the highest quality. This cheese has been produced here since ancient times and if you'd like to see the production methods for yourself, you can visit one of the area's many dairies. This product dates back to the days of Hannibal, who, after the battle of the Trebbia in 217 B.C., was welcomed to Parma with a banquet of 'salted pork thighs'. Nothing is left to chance when it comes to producing Parma ham. It is matured in the appropriate environment, known as the 'baliatici'. The opening and closing of windows in this particular environment is regulated in such a way that slight drafts of air are able to dry the meat whilst ensuring that the typical sweet taste of Parma ham is developed. You cannot possibly leave Bologna without having tried its culinary specialties. The city itself is referred to as 'the fat one' not because of its heavy cuisine, but as a way of expressing its joie de vivre and love of good food. Some of its specialities include homemade egg pasta, as used in the wonderful tagliatelle bolognaise prepared with the typical 'ragù', tortellini in broth, and mozzarella sandwiches. The secret of the Traditional Balsamic Vinegar of Modena, produced from the must of cooked grapes from the Modena region, lies in its slow maturing process (in an appropriate place in the attic), which can take up to 50 years. The particular temperatures guaranteed by the climate in this part of the country are a key factor in making this vinegar what it is, and enhance its characteristic sweet taste. There are numerous places where vinegar is made in Modena and the surrounding areas. Drops of it are usually used in risottos, on shavings of parmesan or even with fruit. Modena is also famous for its good wines. Don't forget to try a glass of the excellent Lambrusco DOC whilst you're here.